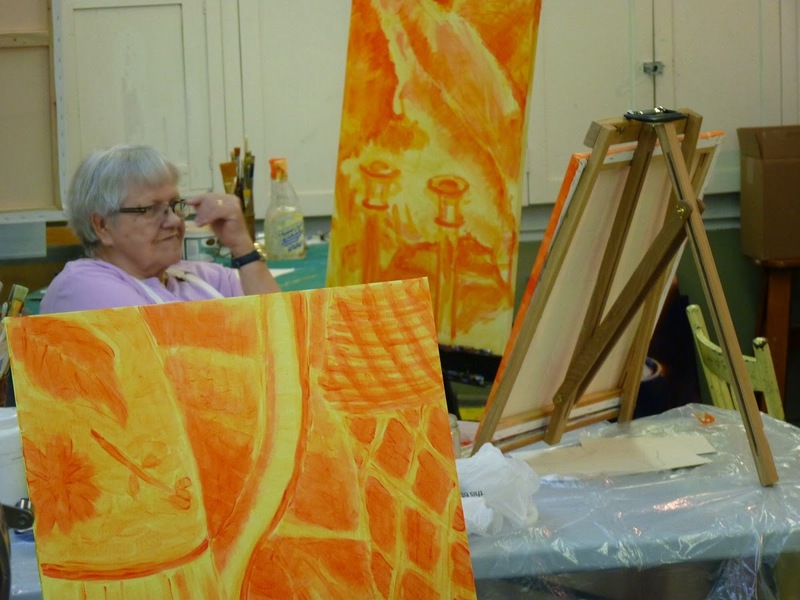 The Art of Michael R. Gaudet: Painting Class at Dauphin MB ''Watson Art Center'' a Success! Painting Class at Dauphin MB ''Watson Art Center'' a Success! I was honored recently to be invited to facilitate a two-day intensive Acrylic Glazing Workshop at the ''Watson Art Center'' in Dauphin Manitoba. The class was held in the lovely old fire hall in downtown Dauphin that is being refurbished to house all things artistic in the district. 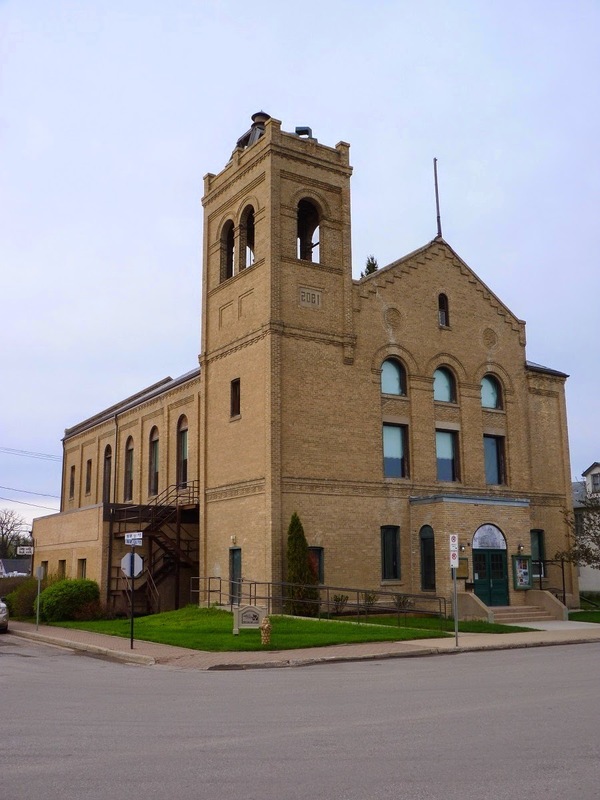 The beautiful old Fire Hall in Dauphin MB is being refurbished to house the artistic activities of the district. 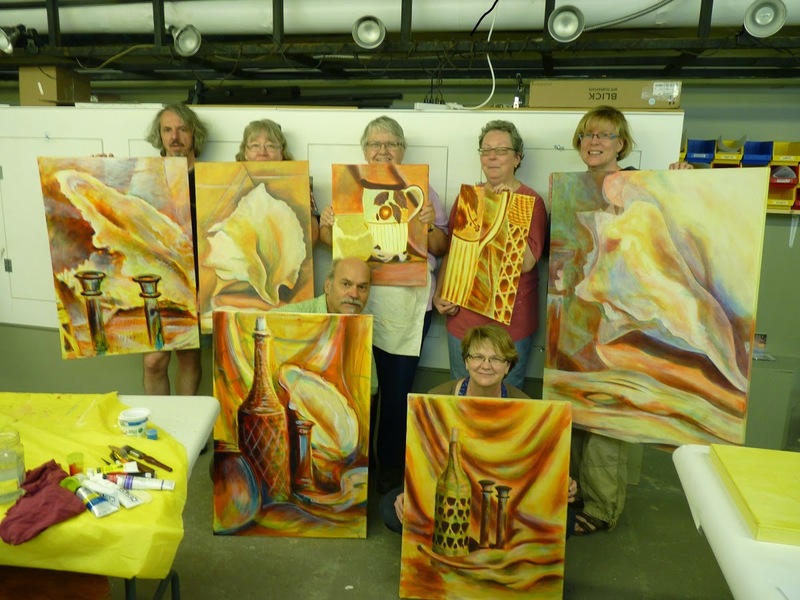 The class was attended by seven participants who all came equipped with their acrylic painting kits including the signature "matte medium'' that is fundamental to the technique that I teach. The only time I allow water to be used is to clean out brushes. The so-called ''glazing technique'' involves the application of many transparent layers in a certain order of hues to at first accomplish a ''full-chroma'' tonal study. We set up a still life in the center of the room that all of the participants were invited to study with the aim of ''zooming in'' on an interesting detail that would serve as the starting point and reference for the exercise to follow. 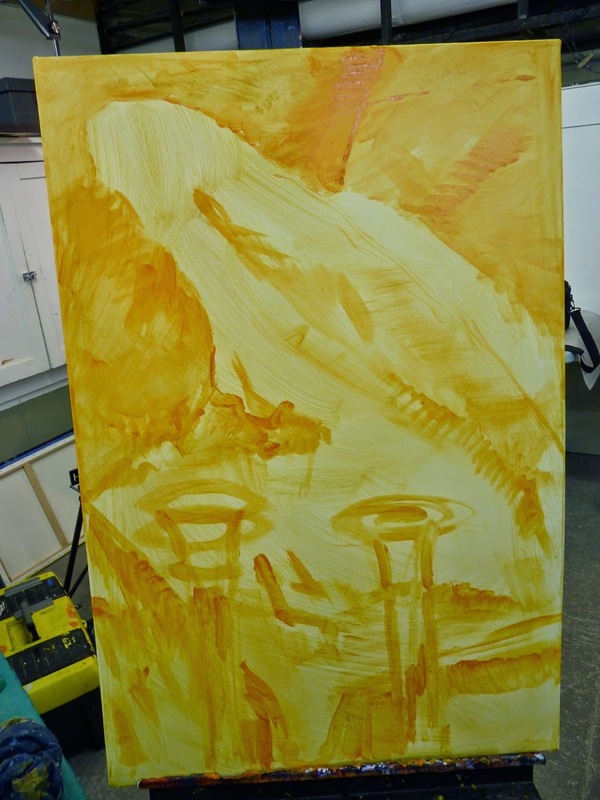 After the glaring white base is tinted a warm golden yellow, the first glaze of transparent orange is applied. 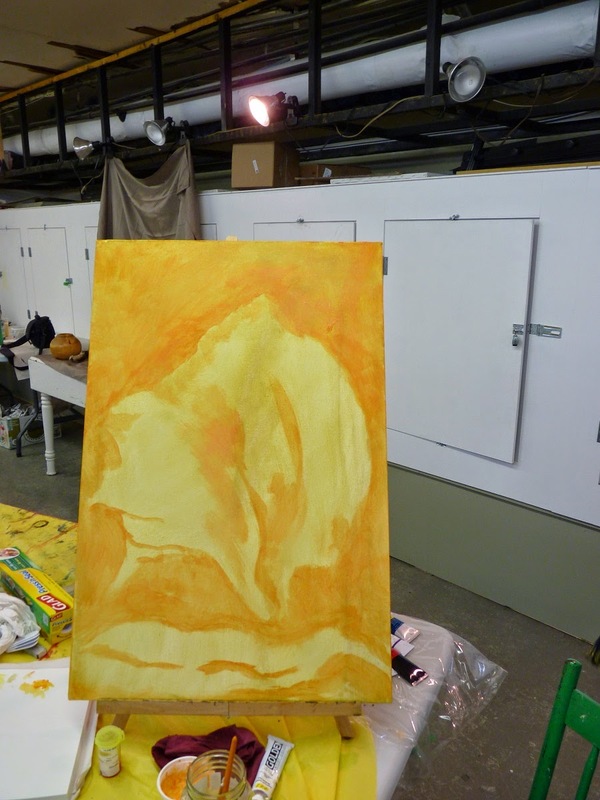 The first step in my approach is to ''sketch" with a transparent orange against a warm golden yellow base what appears to be ''dark'' versus the remaining light. In other words, separating the light from the dark. This process of identifying the dark forms and shapes carries on through the entire spectrum as you will see. Separating the light from the dark with the initial orange glaze. 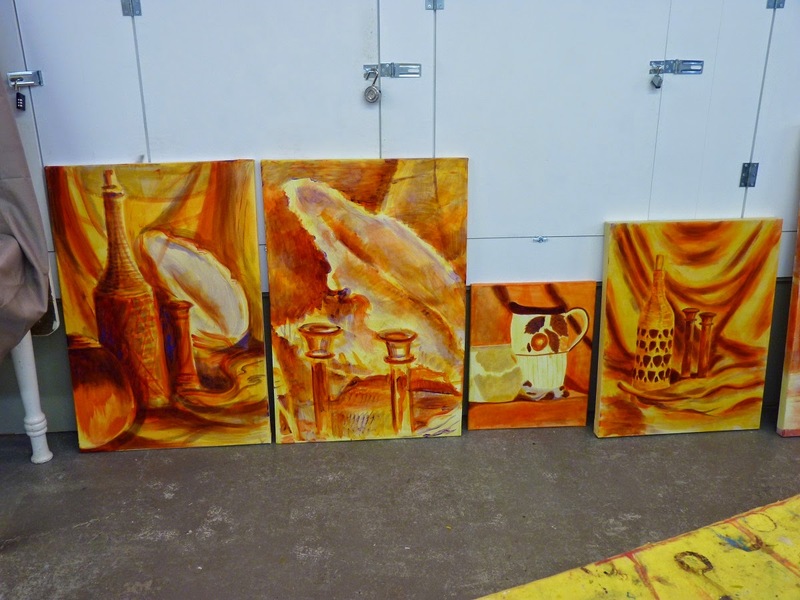 Once the participants established what detail(s) of the still life they would focus on...and I encouraged everybody to ''think big'' as in work on just two or three objects ''writ large'' on their canvas...we all proceeded in tandem to work on each successive glaze. Nothing random whatsoever in this process; rather, it is an organized and systematic approach that emphasizes a ''global approach'' to the painting process. This is in stark contrast to the haphazard approach of ''micro-managing'' that is often the downfall of amateur painters who struggle to maintain continuity in a copy and paste method that sees isolated areas of their work being lavished with attention while other tracts remain unfinished. The result is a constant struggle to create a visual harmony throughout the composition. The first transparent orange glaze is reinforced with a transparent red glaze. The participants are asked to designate ALL of the areas, shapes and forms that are darker than the golden yellow base. This initial step is reinforced by all of the proceeding steps in the tonal study. I think the most powerful advantage of the glazing technique is that the artist is obliged to discern the entire picture field as the work progresses. This is in my opinion the most intelligent and organized way to tackle any subject, as the artist becomes increasingly familiar with the subject with each step, while realizing that the entire composition is coming to life simultaneously. This is the rich effect of the full-chroma tonal study. The participants were invite to line up their paintings for comparison after the study was completed. 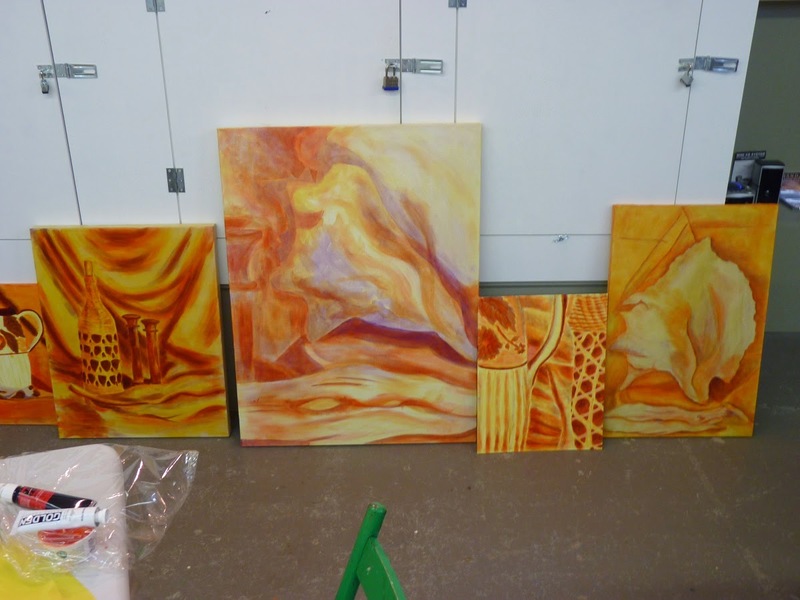 Once the first six glazes were complete AKA the full-chroma tonal study, the participants were invited to line up their works-in-progress for comparison and study. Making progress after a full day's painting to create the tonal study. After a full day's painting we made a lot of progress. The tonal studies were complete and we were now poised to introduce for the first time...the ''local" or ''native'' colors. In other words, the colors that we wished to end up with to faithfully reflect the colors that our eyes perceived in the actual still life. Stay posted for ''Part 2'' of this post, where we tackle the ''Native '' colors aka ''local'' colors in day 2. Oh Michael, how fortunate to get to learn from you. Thanks for sharing. Love the process!